I am a new student. What are my chances of receiving housing? Students who apply and are accepted early to Harris-Stowe State University have a better chance of being offered housing. Housing is offered to students in the order deposits are received. All freshmen who pay the $175 housing deposit to the Department of Residential Life by May 30, are guaranteed on-campus housing if they finish the entire housing process. How do new students request housing? Once students are accepted to Harris-Stowe State University, the Office of Admissions sends each student an acceptance letter. The Department of Residential Life will be notified once the $175 housing deposit has been paid. Housing information will be mailed to all students who have paid the $175 housing deposit. Information for incoming fall students is sent during the summer. Are new students guaranteed on-campus housing? Yes, until May 30, all new students who have completed the entire housing process which includes 1. Housing Application 2. $175 Housing Deposit 3. Registered for Classes 4. Financial Assistance/University Installment Plan. After June 1st the remaining room will be assigned to students in the order that they complete the housing process. Should I wait until I receive information from other schools before I apply and pay my housing deposit? No! Waiting could mean forfeiting the space we have for you. The sooner you pay, the higher your spot on the list. Please remember the houseing deposit is non-refundable. Is there a deadline for me to complete my application? Yes! When a student receives information from Residential Life, there is a deadline to apply. If the student doesn't apply by this deadline, the student forfeits his or her space and his or her name is removed from the list of students requesting on-campus housing. Can I request to share a room with someone I know? Yes. We will do our best to honor your roommate requests; however, we cannot guarantee them. Students wishing to be roommates must select the same roommate and have applications in around the same time. We do not hold applications to wait for a specific roommate request. Applicants will begin receiving their room assignments in July, and assignments will be sent on an ongoing basis thereafter. Room assignments and roommate/suitemate information will be in your housing assignment letter. What does it mean to be assigned to a “suite”? A suite is so much more than just a bedroom. Suites include a common, furnished living room, a kitchenette, dining area and two shared bathrooms. What if I am not getting along with my roommate or want to change rooms? To verify assignments, room change requests are not taken until two weeks after the beginning of the semester. This gives students the opportunity to work out problems and to make the initial transition from home to college. If students want to talk to someone about their situation, they can contact their Resident Assistant (RA) and or the residence hall director. What if I receive an assignment, but change my mind about attending Harris-Stowe State University? Immediately notify the Department of Residential Life in writing of your decision not to attend Harris-Stowe State University. (Note: Notifying the Admissions Office does not constitute notice to the Department of Residential Life.) Policies concerning a refund of prepayment/deposits can be found in your contract. Unless you are released from the terms of the contract, once you are enrolled at Harris-Stowe State University, you are liable for the full housing fee, even if you do not occupy the space. What do I do if I want to cancel my contract? The Residential Life contract is a binding agreement for both the fall and spring semesters. If you decide to live off campus or not to attend the University, you must notify the Department of Residential Life in writing by May 1, in order to receive a prepayment refund. The application fee is not refundable for any reason. Please see the detailed contract cancellation information listed in your housing contract. It is very noisy on my floor. What can I do? Contact the Resident Assistant (RA) on the floor or the residence hall director. My student seems homesick. What can be done to help? Try not to encourage the behavior by calling him or her every day. Encourage the student to get more involved by joining campus organizations and attending programs. The student may wish to contact his or her RA for assistance or a counselor. What if a maintenance problem occurs? For non-emergency services, the student should fill out a work order form at the 24-hour public safety desk. The maintenance team assigned to the building will then handle the request on a priority basis as they are submitted. For emergency needs, the resident should contact the front desk of the building immediately! Yes, washing machines and dryers are located in both residence halls. Will I have to move off campus after my freshman year? No. Gillespie Residence Hall is designated specifically as an upperclassmen residence hall. Current GRH student residents may go to “Room Sign-Up” in March and request their same room in the residence hall. Is there housing for married or graduate students? Presently, we do not provide housing for married or graduate students. Our priority is undergraduate students because of the demand for on-campus housing. Is there an age limit for living on campus? Harris-Stowe State University does not offer undergraduate housing in the residence halls to married undergraduates or undergraduates with families. The age limit is 25. The residence hall is set up for traditional students. At this time, we do not offer nontraditional student housing. If I have a physical disability which requires special housing, what should I do? Contact the Department of Residential Life when you apply for housing, and we will work with you to find a situation that will best accommodate your needs. Are there any curfews in the residence hall? At this current time there are no curfews in place. Student residents are not required to be in the residence hall at a specific time. However, we do have a visitation policy. Can I have visitors in my room? Yes. Refer to the Visitation Policy for details. Residents are required to check-in their guests at the front desk of the residence hall. The visitor must show a picture ID to enter, and the resident must leave his or her ID card at the front desk. What furniture is provided for me as a student living on campus? At Harris-Stowe State University, four students normally share a suite. Extra long twin-sized beds are provided in each room, which includes a closet, chest of drawers, desks and a desk chair. The common living area is equipped with a couch and coffee tables, as well as a small table and chair set in the kitchenette. How do I get a meal plan? Meal plans are required for all students living on campus at Harris-Stowe State University. You will sign up for your meal plan upon applying for your suite in the residence hall. Does the University provide insurance for my personal property? Renters insurance is required for residents living on campus. What about mail, campus parking, a telephone directory and long-distance telephone services? 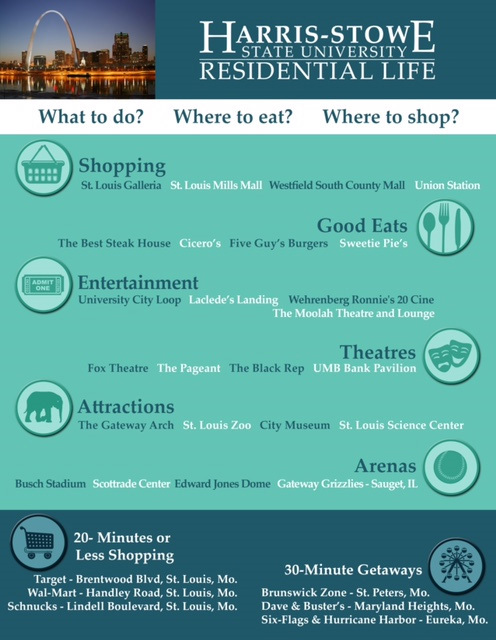 For answers to these questions, please contact Residential Life at (314) 340-5005.